It’s no secret that pools aren’t cheap, and the bigger the more expensive. But there are people in the world who have lots of money. This is what happens when the two meet. The heart of this bathhouse was constructed in 1913, which is reflected in the Art-Nouveau style of the buildings and decorations. At the time, it cost about 3.6 million Austro-Hungarian Krones. This bathhouse is fed by natural thermal springs and boasts 15 indoor pools, 3 outdoor pools, and 10 steam and sauna rooms. The best part? It’s open to the public for a fee of about $20 USD. This pool(?) 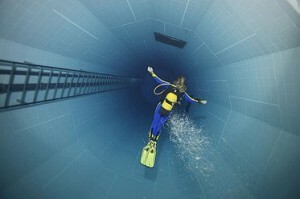 holds the Guiness World Record for being the deepest man-made pool, going down to 113 ft.! This pool cost $3.2 million euros to build. It’s construction simulates underwater caves along with the deep pit going down the middle. It’s a perfect playground for experienced divers. If you can’t dive yet, Nemo 33 offers dive instruction classes too. 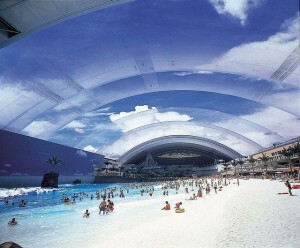 This giant indoor pool was built in 1993 and cost about $2 billion. And this is no mere pool- it’s an entire fabricated ocean and beach, complete with fake volcano, contained within a dome with a retractable roof. No matter the time of year, it’s always a tropical paradise inside. Sadly, the pool was closed down in 2007 for renovations. Built by Red Rock Contractors, this pool cost the Kitchukov family about $1 million dollars. I suppose it was worth it though as it has a waterfall, a fountain, fire pits, and giant palm trees. While only friends of the Kitchukov family can visit this pool, you can still appreciate its existence and drool a little. 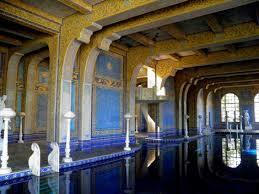 William Randolph Hearst, one of America’s most famous and rich citizens, well, ever. Most well-known for being a newspaper giant, Hearst used his money to build his own private castle (and that’s not an exaggeration). The grounds include two pools, the Neptune and the Roman bath. One source estimates the property cost about $10 million to construct. Both are built to the upmost luxury, using marble (lots of it! ), gold infused tiles, and many handmade sculptures based off ancient originals. While it is possible to tour the castle, including the two pools, they’re not open for swimming. Lav Leviev is an Israeli billionaire who made his fortune in diamonds, he bought his London residence for about $52 million USD in 2008. The pool has gold covered mosaic tiles. The poolroom can also be converted to a ballroom with dance floor via a retractable cover. Alas, the likelihood of taking a dip in this pool is slim to none. 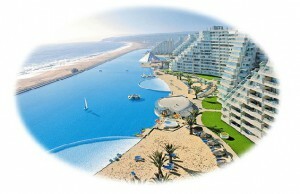 Officially the world’s largest swimming pool, San Alfonso Del Mar cost $2 billion dollars to build. Located on the beach front, the pool uses technology developed by the builder, Crystal Lagoons, which filters and pumps the nearby ocean water into the pool. This means they don’t have to pay for the water to fill the pool, which is good because it’s 1 kilometer long and holds 66 million gallons of water! This pool is large enough to sail a small boat in and is connected with a resort and condominium complex. This apparently wasn’t enough for Crystal Lagoons either. They are reportedly in the process of planning and constructing a new swimming complex that will blow San Alfonso out of the water. The new complex, CityStars, in Sharm El Sheikh, Egypt, is planned to break the largest pool record by almost a whole hectare. It will also include many “smaller,” lagoon pools, and basically end up being its own small city. What’s the best pool you’ve ever been to? 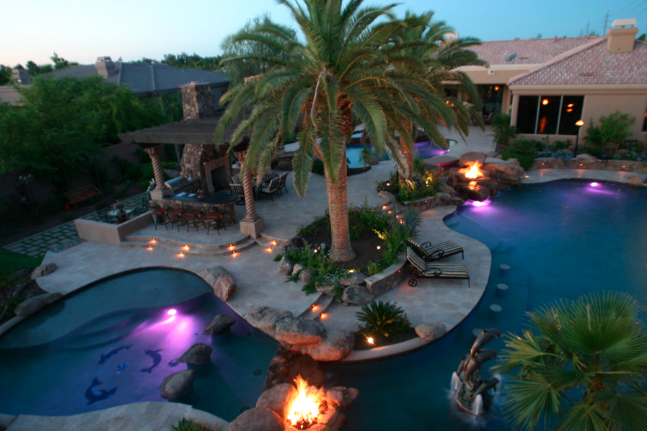 What’s your dream pool to swim in?